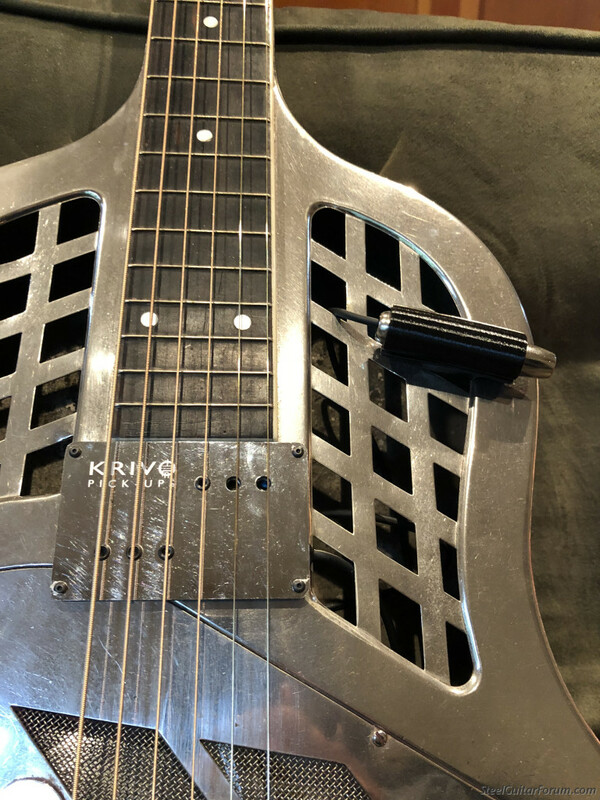 Surface mounted pickup for resonator? Topic: Surface mounted pickup for resonator? I have a metal bodied resonator. sounds great acousticaly. But I would occasionaly like to amplify it, in a band situation. I am looking for a thin pickup that I could surface mount between the end of the neck and resonator. It would have to be shallow less than 5/8". I dont want to drill or cut into the body. Doe's any have experience with these? I have one of those (Lace Ultra-Slim) on my Johnson squareneck tricone. It attaches with a big soft adhesive pad, and removes easily from a metal body with minimal cleanup. It captures some of the acoustic-reso sound, and can be plugged straight into a guitar amp with good results. You can crank it up to a decent volume level before it begins to feed back. I ran the wire on mine down thru the screenholes to a 1/4" jack on the body, so it's semi-permanent. For lap-style it has one disadvantage: if you play high notes "above" the pickup, there is no sound. Maybe no problem if you play bottleneck style. So, I also installed a Schatten tricone transducer that mounts on the t-bar bridge. Gets a little more of the cone tone, and is located so you it picks up notes way above the 24th fret if you go there. Can be installed externally, but mine is routed to another 1/4" jack. The Lace pickup is about 3dB louder than the transducer. I tried to wire them together with a blend control, but one is magnetic and one is piezo, so that did not work. But, I can use either or both as needed. For both, need a 2-channel amp. If you use both pickups and a mic, it really sounds big. Thank you James, I ordered one of the Vintage Artist's (only $19.95 plus shipping) I figured why not. I will let you all know how it works out. I purchased the pickup and it arrived very quickly in the mail. But it took me a week to get around to installing it. I am very pleased with the sound, strong signal, nice balanced frequency output. Posted 28 Apr 2008 6:30 pm Which model did you order? Which model did you order? I noticed that there is the slim humbucker which mounts to the neck with the supplied bracket or there is the first one. I'm asking because I use resonators and would like to amplify them as well. did you wire it to a cable, a on board preamp. a 1/4 inch jack or plug? could I just wire it to a jack and run a line to a volume pedal? what'd you do? Dom, I thought you would be pleased with it. 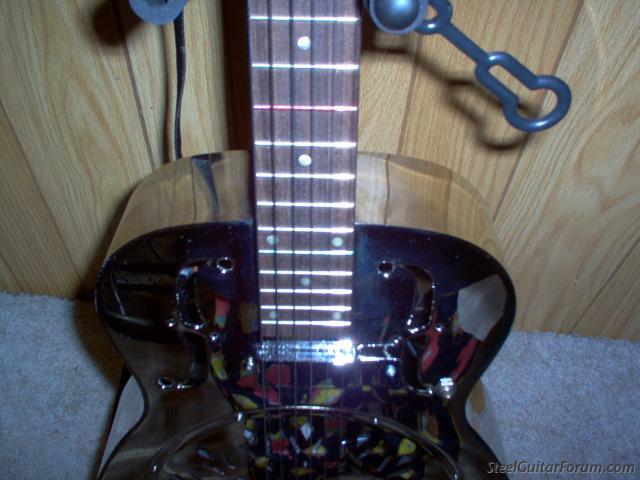 I use the neck mounted Pickups on Resonators and Mandolins. I just bend the brackets to fit the Mandolin necks. AJ, On the Resonators I wired mine with the wire thru the instrument top, under the Pickup and used a 500K volume pot and installed a 1/4 inch jack. I did the Mandolins the same except I installed a SPDT switch to use with the already installed 1/4 inch jack on the Mandolins. My MK FSE Mandolin has a Fishman System 1 Pickup and preamp in it but it has too much feedback at loud volume. The Artec has no feedback at full volume with Bass and Drums close to it. I ended up drilling a small hole under the pickup and running the wire to a 1/4" female jack. 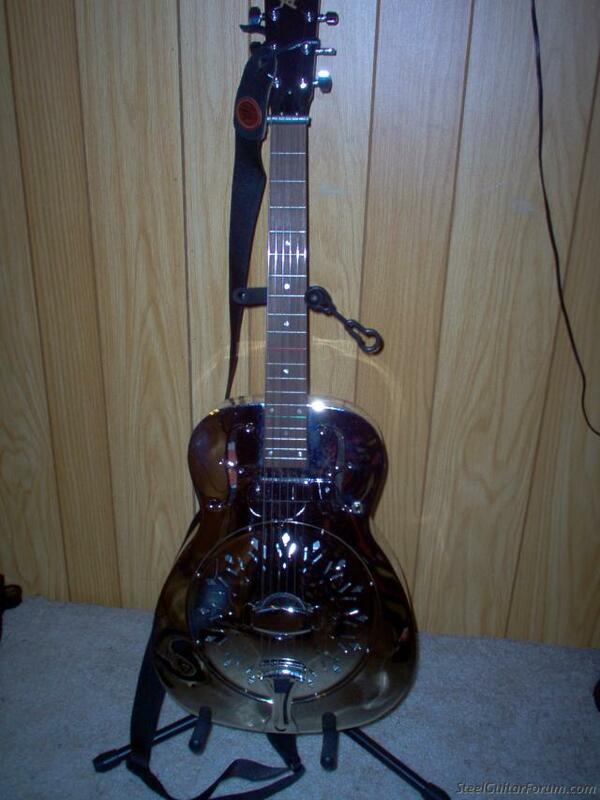 The chrome finish perfectly matches the resonator body, and the pickup itself covers the hole and the wire. It looks perfectly natural, not like an "add on"
I didn't use a preamp, or volume control. it's plenty loud enough by itself. I can get feedback if I play loud and sit close to the guitar amp, but through a PA system, it will be no problem at all. where'd you get the endpin jack? Posted 15 May 2008 9:33 am pickups? Hi guys I also got a couple of those pickups that you were talking about and I finally received my package yesterday. I opened it up and those pickups sure are slim, but when I tried to place them under the strings at the end of the fretboard, they wouldn't fit. The strings hit the tops. My 3 single cones are Johnsons and my tricone is a Regal. The pickups wouldn't fit under any of them. Am I missing something simple here or are my resonators not setup properly. 2 single cones are in standard tuning, the other is in open G and the Regal tricone is in open D, if that helps. Sorry I didn't include that tidbit of information, they are all round necks. I play them all in the Spanish manner and not lap style. Laurent, without a raised nut they may not work because of the low string heigth. You may can use 2 sided tape and mount them near the bridge. They work fine in my mandolins, and my resonators are square necks. Hey James, that's what I kind of figured. I'm going to try them near the bridge or close to it. In your experience, will the sound be super trebly? Just curious. Maybe I should just splurge on those hotrod plates with a pickup built in eh? Here are some photos of the installed pickup. The chrome finish matches the guitar so well it blends in and can hardly be seen! there's a somewhat new kid on the block - an unpotted magnetic pickup created specifically for resos..unpotted so it picks up body vibrations...they work great for me...I put them on wood-and-metal-body tricones...mostly have to shim them because they are TOO thin! One example shown here...on the Style 1, it was just the right height ...strings are low on those old ones.. While that looks pretty awesome, I was really hoping for something similar to the one referenced above in terms of both function and price point. Yes, it is the same pickup that you have made reference to in your eBay link. Andy, I'd be willing to be that the budget humbucker would make your cheap Regal sound pretty much like a lap steel. I don't have a Reso, but I have used a Krivo pickup on a Macafferri style guitar and they are great. Crystal clear and great separation. I love the design of the unpotted version for the Reso.